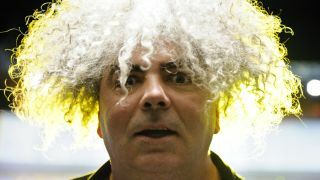 When you’re a band with a back catalogue as overwhelmingly massive as the Melvins do, it’s kind of hard to pick your 10 favourite records of your own. In fact, according to frontman Buzz Osbourne, “it’s nearly impossible”. Since forming in Montesano, Washington in 1984, the group – rounded off by drummer Dale Crover and a constantly revolving cast of bassists – have released a staggering 25 studio albums, 14 EPs, 12 live albums and 10 compilation records and have never settled on one idea for too long. But where do you start when your back catalogue includes everything from live experimental noise sets to collaborations with Jello Biafra and Lustmord? “I rarely know what people want but that doesn’t bother me too much”, says Osbourne. “The fact is, I would never have been happy doing the same thing over and over again. That wouldn’t have been me. Plenty of other bands could have gone down that line too, I just don’t think they had the guts to do it. But I’m not afraid.